Papaya is a fruit that does not get enough credit. It is a fruit that is jam-packed with vitamins, mineral and enzymes. Lately, papaya is known for its skin benefits, as the enzymes contained in papaya are great for exfoliating, acne and dry skin. They are cancer and heart disease preventers, and are also good for averting eye problems such as blindness. Useful buggers, right? The exact origin and timeline of discovery of papaya is difficult to determine but the fruit originated in Central America, most likely along the Caribbean coast somewhere and cultivated by the people in that region for centuries. The ancient Mayans honored the papaya tree as sacred, calling it the tree of life. 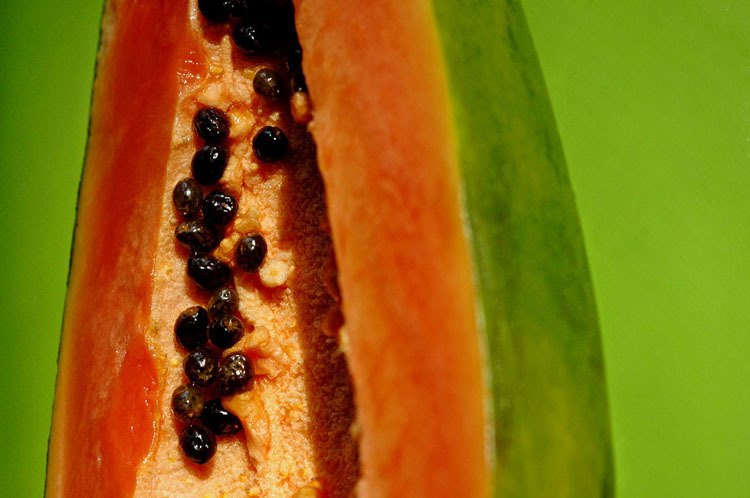 When the Portuguese and Spanish invaded the Americas, papaya became a favored fruit among the Europeans and they were instrumental to spreading the seeds throughout the rest of the Caribbean, Pacific Islands and Asia. Papaya seeds are stubborn and keep for long periods of time, so making long journeys were possible. I like eating papaya with lemon juice squeezed over it. Normally the papaya has a very distinct yet subtle flavor and the acidity of the lemon enhances the fruit perfectly. Think of the movie Ratatouille when the rat tastes cheese and fruit together and little fireworks start going off in his head. That is papaya and lemon! It’s a staple in the Hawaiian breakfast and should be a part of everyone else’s! Papaya are also great in smoothies, ice creams, juices, salads, by itself and countless other ways! What’s your favorite way to eat papaya? Let us know! Have anything you want to share? Contact us at knivesandneedles@gmail.com or tag us on IG: @knivesandneedles!